You may have heard about some 1943 coins that are particularly special or rare. You’ve probably even been checking your pocket change for 1943 pennies, nickels, dimes, and quarters but aren’t exactly sure what you’re supposed to be looking for. I always enjoy answering questions from our readers — especially coin collecting newbies who have have heard stories about but haven’t really begun to discover all of the incredible facts behind our nation’s coins. They often want to find out more. So, what are 1943 coins worth anyhow? How do you find these old coins in pocket change? Are there any cool facts behind these vintage coins? I’ll answer all of these questions below! What Are 1943 Coins Worth? The United States Mint made 15 regular-issue 1943 coins, including pennies, five-cent coins, dimes, quarters, and half dollars. Notice how the prices appear pretty much uniform among each of the 5 denominations? That’s because all the coins are of more or less equal availability and none of them are considered rare coins. 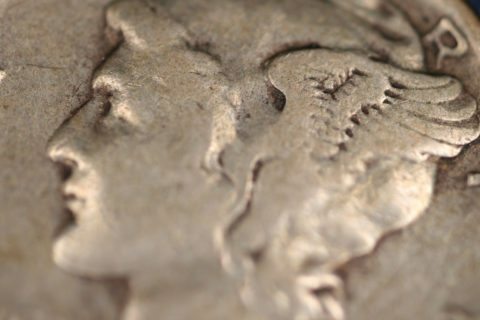 You may be wondering why coins from the 1940s aren’t rare these days. However, millions of these coins were made. In fact, there were more than 1 billion 1943 steel wheat pennies made! So what about that 1943 penny that’s worth $100,000? The rare 1943 penny you’ve probably heard about isn’t a steel cent, but rather the 1943 bronze penny — the 1943 penny that was accidentally made with copper instead of steel. Nobody really knows how the 1943 bronze penny came to be, but it’s suspected that there were between 20 and 40 combined copper planchets in the hoppers at the Philadelphia, Denver, and San Francisco mints. Somehow, those bronze planchets were accidentally fed into the coin presses. Rare 1943 bronze pennies do not stick to a magnet. Steel pennies are attracted to magnets. The 20 to 40 of the 1943 bronze pennies that exist are now worth between $75,000 and $150,000 or more, based on their individual conditions. Why Are 1943 Coins Worth Collecting? You’ve probably heard all the hype about 1943 coins and that you should be looking for them in pocket change or wherever else you can get your hands on them. As you now know, there are about a half dozen rare 1943 error coins and varieties — including the 1943 bronze pennies. 1943 steel pennies were made to help ration copper for World War II ammunitions. That means even the very common 1943 steel cents are historic in their own right because they were made to help our troops and Allied Forces fighting in the war. 1943 nickels are also historically significant. Unlike regular Jefferson nickels (which are made from 75% copper and 25% nickel), Jefferson nickels made from late 1942 through 1945 are made from a composition consisting of 56% copper, 35% silver, and 9% manganese to ration nickel for World War II artillery. For that reason, all war nickels — like all steel cents — are also historic. If you think about it, all circulated 1943 coins have an important story to tell. They were minted and originally spent as money during a very critical, colorful time in our national history. If you don’t know much about the World War II era, I kindly urge you to check out what was happening in our country at the time — it’s a really interesting period to study! Is There An Easy Way To Find 1943 Coins In Pocket Change? The easy way to answer this question is with a “NO” — there is no easy way to find 1943 coins in pocket change. The 90% silver 1943 Mercury dimes, Washington quarters, and Walking Liberty half dollars haven’t really circulated since the 1960s — though there are occasional reports of old 1943 silver coins popping up in pocket change every now and then. 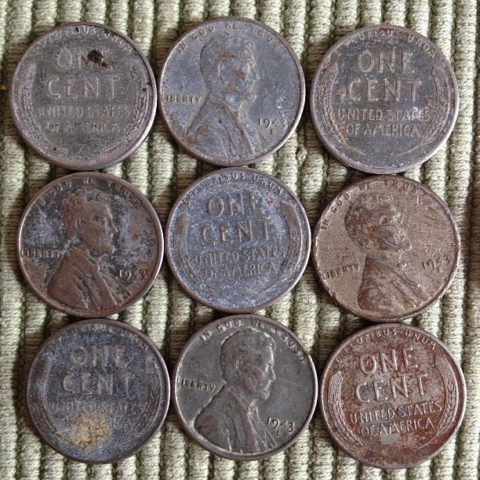 It’s also pretty difficult to find 1943 steel cents in circulation — because they look so different from “regular” Lincoln cents and, for that reason, people tend to pluck them when they turn up. Since I became a coin collector in 1992, I’ve come across just one 1943 steel Lincoln penny in pocket change or through roll searching. Just one… in nearly 25 years! Perhaps the easiest 1943 coin to find in circulation is the Jefferson war nickel. Why’s that? Why is this silver coin easier to find in circulation than a steel penny? Actually, the answer is quite simple: few people who aren’t coin collectors know how to distinguish a 35% silver Jefferson nickel from a regular Jefferson nickel. And because silver Jefferson 5-cent coins generally look like typical nickels, most non-collectors gloss right over these coins. On the reverse (“tail’s side) of war nickels, you’ll notice a “P,” “D,” or “S” over the top of Monticello. That letter is the coin’s mintmark. Only the war nickels — which were made from 1942 through 1945 — have this large mintmark over the dome of Monticello. The presence of this large mintmark over the top of Monticello is how you can tell a silver Jefferson coin from a regular nickel. Another, more nuanced, way to tell circulated war nickels from regular nickels is the color and feel. A worn war nickel appears darker and feels greasier than a regular nickel. The greasy feel comes from the presence of manganese in the war nickel. The most efficient way to look for any old coins, including 1943 coins, is to check through rolls from the bank. Many collectors tend to find old coins by looking through enough rolls. Patience is the key with this method of looking for old and rare coins (versus buying them from a coin dealer), and sometimes it pays to buy rolls of coins from different banks. The silver color you see on 1943 pennies is a zinc coating over a steel core. A 1943-D bronze penny, the only known specimen from the Denver Mint, sold in 2010 for $1.7 million! Some 1944 pennies were accidentally made from steel instead of copper. These 1944 steel cents are about as rare as the 1943 bronze cents. The 1942-P Jefferson war nickel became the first U.S. coin to ever bear a “P” mintmark for Philadelphia. The Walking Liberty half dollar (struck from 1916 through 1947), which is considered one of the most beautiful silver coins in the world, was designed by Adolph A. Weinman. He also designed the Mercury dime, which was struck from 1916 through 1945. Other nations, such as Canada and with its tombac 5-cent coin, also produced coinage from alternative metals during World War II to help ration certain materials for the war effort. Why Are 1943 Copper & 1944 Steel Cent Errors So Valuable?